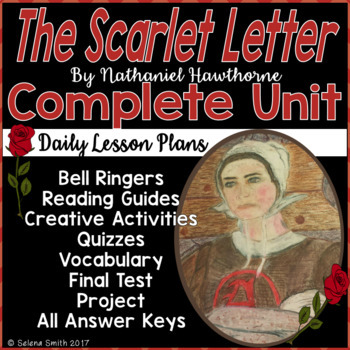 The Scarlet Letter Unit includes everything you need to teach this novel by Nathaniel Hawthorne. This unit is challenging and fun with a variety of strategies to reach a variety of learners. Activities that require higher order thinking, drawing, discussion, reading non-fiction relative texts, analysis, creativity, application, competitions, close reading, video suggestions, synthesis, and more. Students will also delve into simile, metaphor, personification, oxymoron, onomatopoeia, allusion, and irony through challenging tasks. Quizzes - every 3 chapters has a quiz in 2 versions that is also editable. Final Test - 30 multiple-choice questions, 10 True/False, 5 Explanatory Writing (which are questions that require an explanation rather than a short answer), and an essay option. This test is in 2 versions and is editable. You will love the variety and rigor that this unit provides!